I spent a significant portion of my life steadfastly maintaining that mushrooms were for trolls. 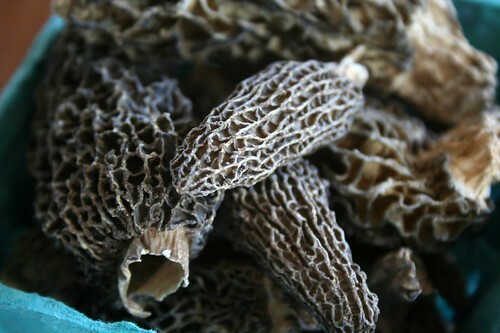 Most kids would have been content to simply wrinkle their noses and refuse to eat mushrooms, but I built up an elaborate justification for my distaste: namely that mushrooms are squishy and grow in wet, woodsy places. Where trolls live. And, what with my not being a troll and all, I couldn’t reasonably be expected to eat them. Of course, then I became a vegetarian, so I couldn’t reasonably be expected to eat cute little animals who had lived lives of suffering and misery either. 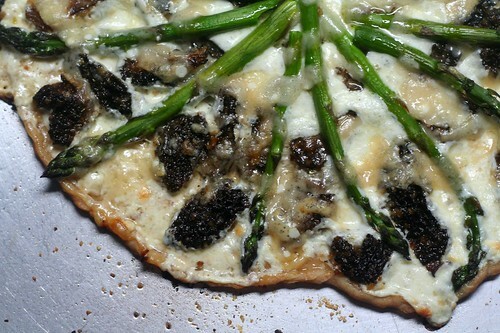 I can be rather difficult at times, which is probably why those who knew me in my troll-food days feel particularly vindicated when I call them to enthuse about an upcoming mushroom festival or to describe the day I spent helping a farmer inoculate logs with shiitake spawn or to report that I’ve just eaten an entire morel and asparagus pizza and boy was it yummy. For months now I’ve flipped wistfully through magazine after magazine, mooning over photos of dark green stalks and oohing and ahhing at recipes as I daydream of Spring. I’ve repeatedly paused beside the co-op’s local produce cooler, glancing from turnip to, well, turnip and heaving great put-upon sighs before wending my way listlessly among the monotonous aisles of pantry staples. I’ve attempted to cheer myself up by flirting with spinach and chard and other leafy greens as they’ve appeared, but I’ve remained inconsolable. 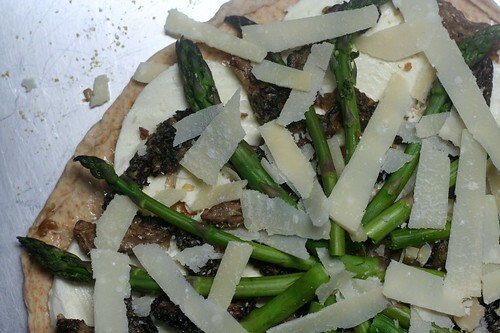 I’ve been waiting for asparagus. What I hadn’t counted on, despite the praise heaped upon them by every publication from Bon Appétit to National Geographic, was ramps. 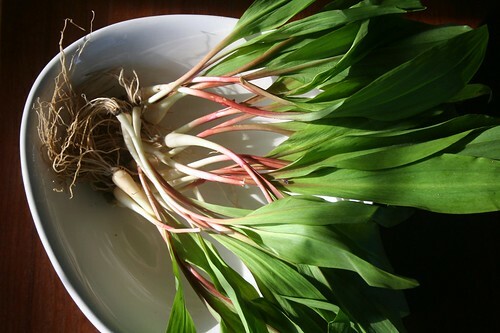 Wild ramps, by virtue of their very wildness, are a hallmark of culinary hipster-dom, the food world’s equivalent of skinny jeans and high-top Chucks and loving that band long before you’d ever even heard of it. But that’s no reason not to try them. 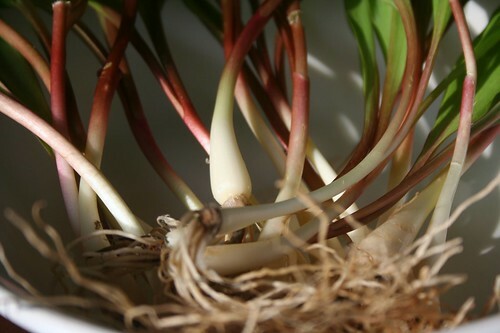 Ramps grow in moist, wooded areas across most of the US and parts of Canada and are easily distinguished from their lily of the valley look-alikes by their ridiculously oniony smell. 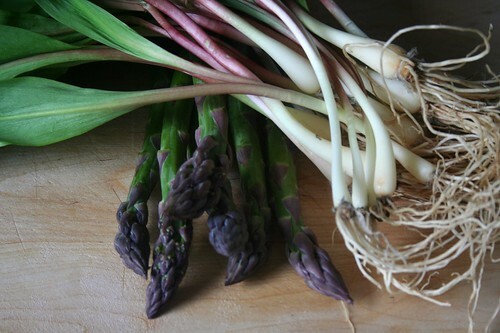 I found mine not far from the asparagus — in the produce cooler, safe and sound inside a clear plastic bag bearing a handwritten sticker that identified them as wild ramps. I suspect this makes me a bit of a poseur, but as long as I steer clear of broken-in chinos I’ll probably be okay.